It’s one of the best games of 2018, and one of the greatest franchises to hit consoles. Thanks to Dark Horse Comics, God of War is now a comic, giving us an early look at Kratos and his son, Atreus. Written by Chris Roberson (Hellboy and the B.P.R.D.) , with art by Tony Parker (This Damned Band), colors by Dan Jackson, letters by John Roshell and a beautiful cover by E.M. Gist, this book is easy for someone to jump on board with, even if you haven’t played the most recent entry in the video game series. It looks like this game takes place before the events of the 2018 game, so if you go in with the knowledge of who Kratos is, you are more than ready to dive into this book. Kratos is, of course, the Ghost of Sparta, a warrior endowed with abilities, and his skin etched with the ashes of his family. He took on the Greek pantheon, but in this story, he is set in a world watched over by the Norse mythological figures. We see Kratos trying to give up his life of bloodshed and pain. He is married now, and with a son that looks up to him. 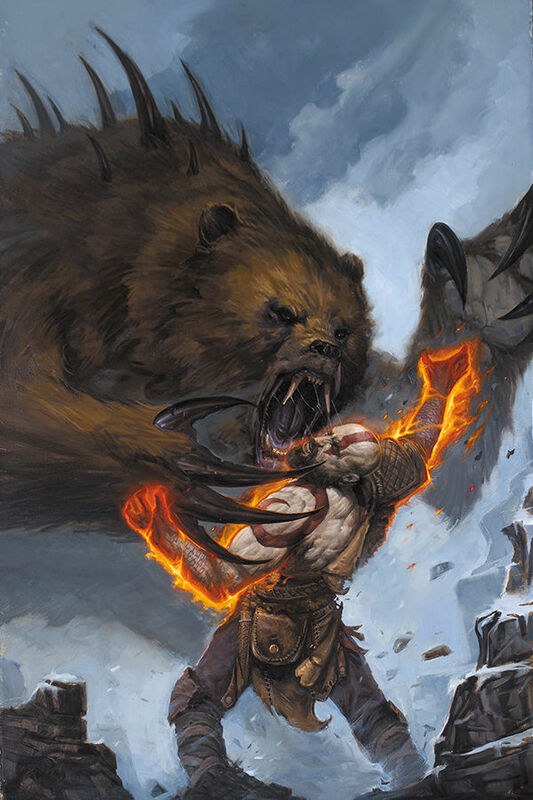 But the bloodlust and rage continue to boil, and Kratos finds a challenge in a demonic bear mauling an old man. It is these actions that set forth what’s to come in the series. Roberson has crafted a story that fits perfectly into the God of War lore, as Kratos reads as he sounds in the games. Parker’s art looks great, especially in the battle scene with the demon bear. The pure rage of Kratos jumps off the page as he fights the beast, and what a fight it is. With a cliffhanger that will leave you wanting more, God of War is a fantastic journey to the Norse lands.